During my 3D modelling days, I was fairly active in the online Transformers community. I would regularly post my work on various message boards and made a number of friends. 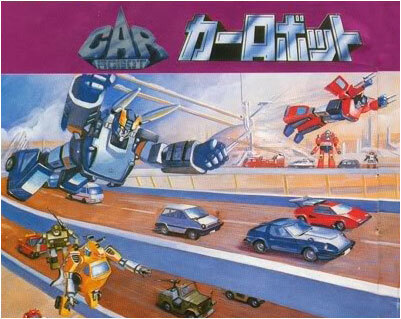 I would also scour the internet for sites similar to mine to see what other 3D Transformers enthusiasts were up to. 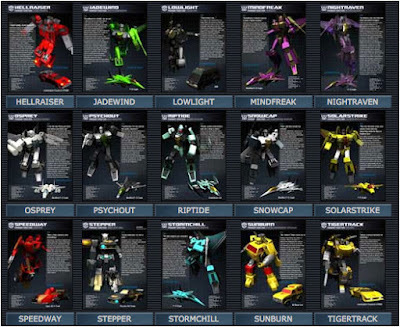 Then I came across a site called CUSTOM MASTERS by PROWL PANTS! 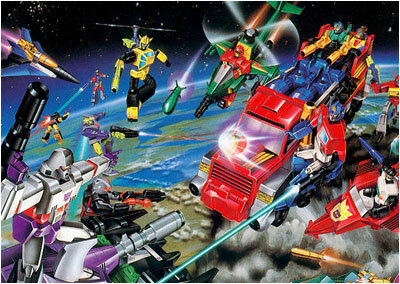 * It was run by a guy named Joe Toscano who did customized Transformers Action Masters. 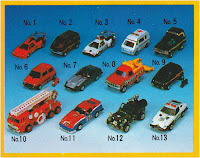 For those not familiar with what Action Masters were, they were Transformers released towards the end of the vintage toyline. Basically, their “gimmick” was that they were fairly articulated Transformers who couldn’t transform. 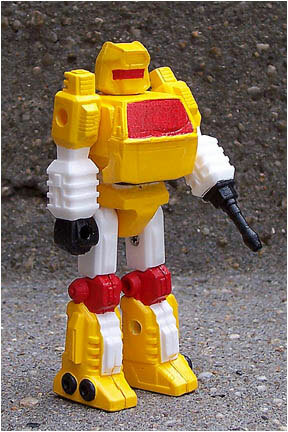 They were more like straight up action figures, closer to G.I.Joes, who had accessories, weapons and vehicles who did all the transforming instead. Anyway, Mr. Toscano was really into these little dudes and had a website filled with all his custom creations. While he had customs of actual existing characters that were never officially released, he also had a lot of characters that he made himself. 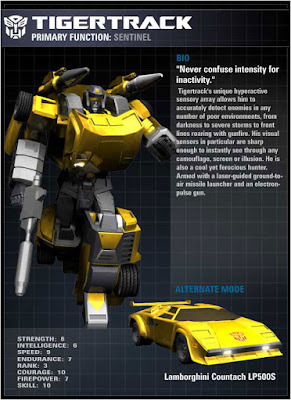 To be fair, most of them were just recolors of existing Transformers, but what I really liked is that aside from just making a figure, he would flesh out his creations by creating “tech specs” or profiles for each of them, just like the official toys. I really enjoyed going through all the different characters he created and a lightbulb went off in my head. I shot him a email telling him I really enjoyed his work and asked him if he would be OK with me taking some of his characters and making my own 3D interpretations of them. A few days later he replied giving me his blessings and so I set to work. 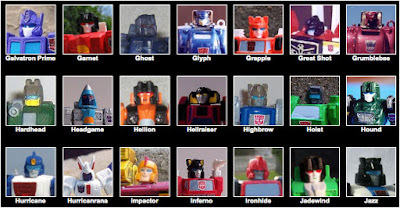 As it turned out this random contact turned out to be mutually beneficial as creating 3D versions of Joe’s work inspired me to create my own characters, which in turn, Joe made into custom action masters! How’s that for a cool collaboration? 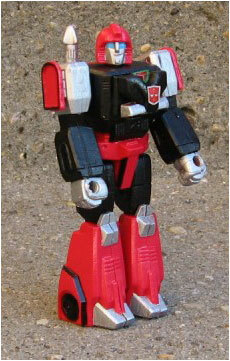 Anyway, I spent quite some time “expanding” my custom Transformers universe. 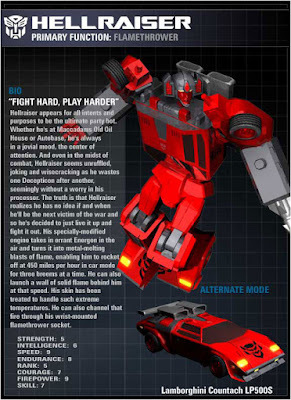 And while I would sometimes write up my own bios for the characters I would create, I also enjoyed collaborating with other fellow Transformers fans who were more accomplished writers and getting them to flesh out my creations. 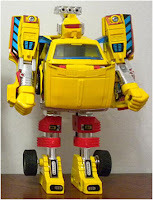 More often than not the jumping point of my expanded universe characters would be actual toys released in the Japanese pre-Transformers line Diaclone. Like I mentioned earlier many of these were basically color variants of characters we were already familiar with, like a yellow Sideswipe or Trailbreaker or a red Sunstreaker or Mirage. I would just add some embellishments to my designs in order to make the end result a little bit more unique. Nowadays, Takara and other 3rd party companies have also jumped on the bandwagon releasing modern versions of these obscure Diaclone recolors, sometimes going as far as making their own original characters as well. Anyway, I’d like to share with you some of the characters I created with the help of other fellow talented Transformer fans like Mr. Toscano. As well as pics of Joe's original custom masters. I would like to apologize though in advance as it has been quite some time since I did these that for the most part I have mostly forgotten exactly who wrote what bio. Nevertheless, I am still very appreciative of all the help I received in fleshing out all these “new” Transformers. First up, we have the yellow Sideswipe and red Sunstreaker which both originally started out as Diaclone toys. Years later, Takara would make the yellow Sideswipe an “official” transformer, releasing him as a Figure King exclusive named Tigertrack. 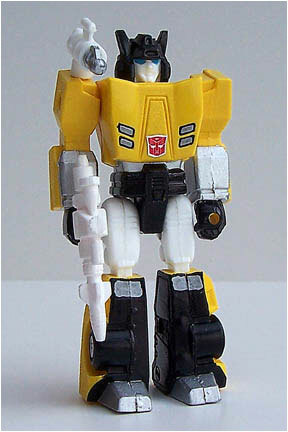 They also later released him in masterpiece form a few years ago. Now I’m not sure if there is now an official Tigertrack bio but this is one that we came up with. "Never confuse intensity for inactivity." Tigertrack's unique hyperactive sensory array allows him to accurately detect enemies in any number of poor environments, from darkness to severe storms to front lines roaring with gunfire. His visual sensors in particular are sharp enough to instantly see through any camouflage, screen or illusion. He is also a cool yet ferocious hunter. Armed with a laser-guided ground-to-air missile launcher and an electron-pulse gun. 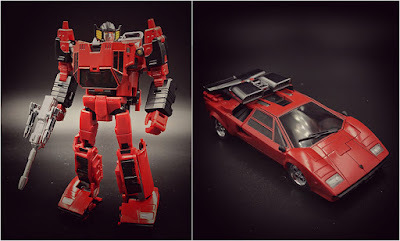 As for the red Sunstreaker, to date there has not been an official Takara release of this guy, but 3rd party company did their own version named Sentinel Blaze. Before that release however, I had him in my universe as Hellraiser. Hellraiser appears for all intents and purposes to be the ultimate party bot. Whether he's at Maccadams Old Oil House or Autobase, he's always in a jovial mood, the center of attention. And even in the midst of combat, Hellraiser seems unruffled, joking and wisecracking as he wastes one Decepticon after another, seemingly without a worry in his processor. The truth is that Hellraiser realizes he has no idea if and when he'll be the next victim of the war and so he's decided to just live it up and fight it out. His specially-modified engine takes in errant Energon in the air and turns it into metal-melting blasts of flame, enabling him to rocketoff at 450 miles per hour in car mode for three breems at a time. He can also launch a wall of solid flame behind him at that speed. His skin has been treated to handle such extreme temperatures. He can also channel that fire through his wrist-mounted flamethrower socket. 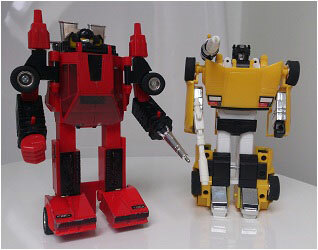 Next we have two more character recolors in a yellow Trailbreaker and a red Mirage, also originally Diaclone releases. 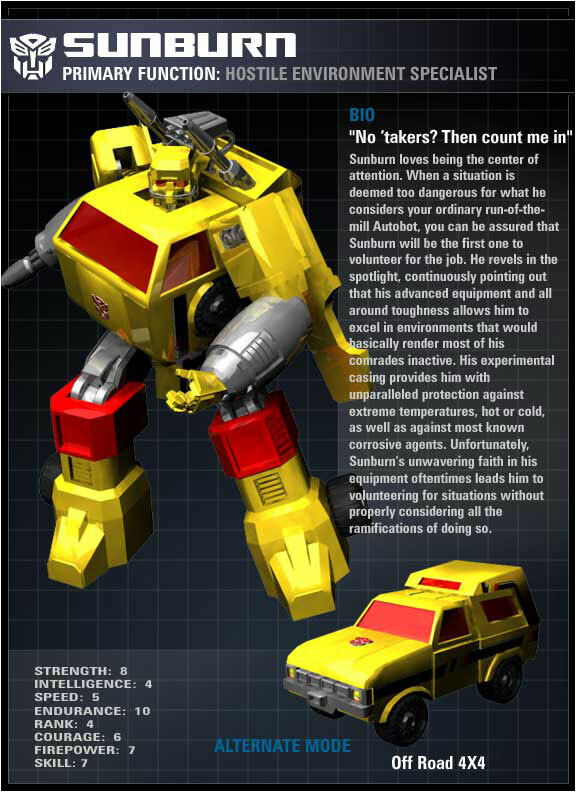 I used the yellow Trailbreaker as a base for my own character called “Sunburn”. 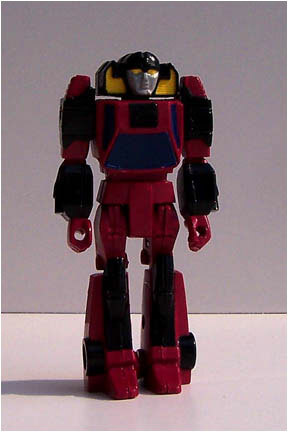 To differentiate him from Trailbreaker, I retained the original faceless toy head, making him into a hostile environment specialist. Sunburn loves being the center of attention. 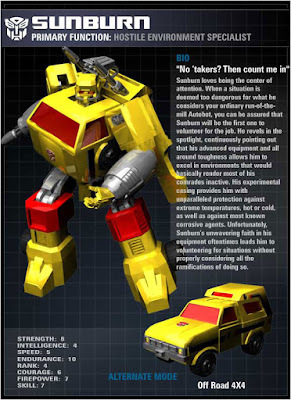 When a situation is deemed too dangerous for what he considers your ordinary run-of-the-mill Autobot, you can be assured that Sunburn will be the first one to volunteer for the job. He revels in the spotlight, continuously pointing out that his advanced equipment and all around toughness allows him to excel in environments that would basically render most of his comrades inactive. His experimental casing provides him with unparalleled protection against extreme temperatures, hot or cold, as well as against most known corrosive agents. Unfortunately, Sunburn’s unwavering faith in his equipment oftentimes leads him to volunteering for situations without properly considering all the ramifications of doing so. 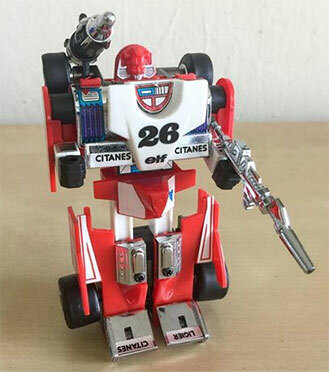 The red Mirage was dubbed Speedway. And I went the extra mile and changed my characters gender to a female because….why not? I also tweaked her color scheme a little replacing the white with gold, but still keeping her predominantly red color. 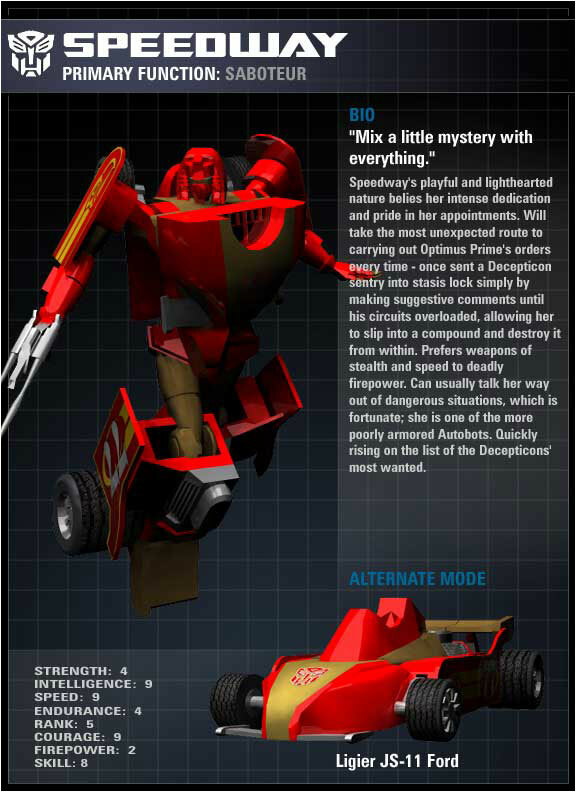 While she didn’t have Mirage’s specialty of invisibility, she was still quite the stealthy Autobot using her skills as a Saboteur. "Mix a little mystery with everything." Speedway's playful and lighthearted nature belies her intense dedication and pride in her appointments. Will take the most unexpected route to carrying out Optimus Prime's orders every time - once sent a Decepticon sentry into stasis lock simply by making suggestive comments until his circuits overloaded, allowing her to slip into a compound and destroy it from within. Prefers weapons of stealth and speed to deadly firepower. 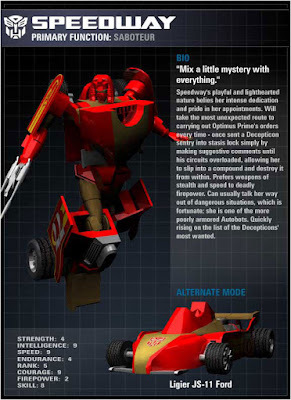 Can usually talk her way out of dangerous situations, which is fortunate; she is one of the more poorly armored Autobots. Quickly rising on the list of the Decepticons' most wanted. 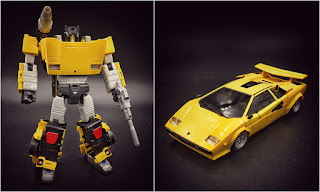 Years later, another 3rd party company released “masterpiece” versions of both these recolors as convention exclusives. 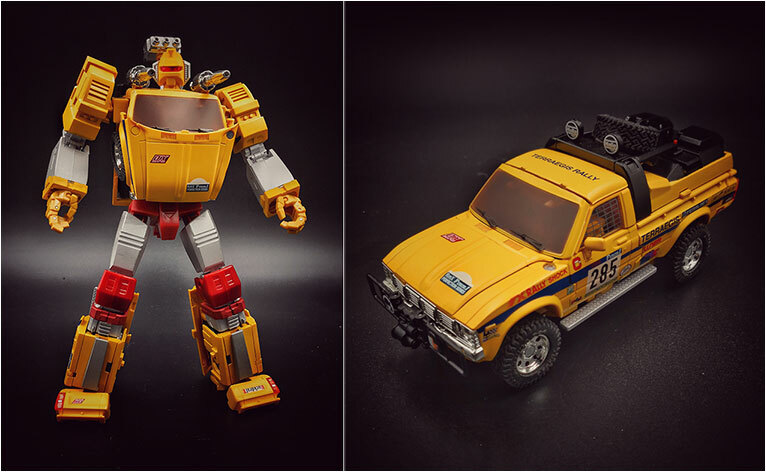 Their yellow Trailbreaker was called Terreagis Rally and the red Mirage was called Liger. Both came with alternate toy heads in order to differentiate them more from “official” counterparts. An added additional touch I appreciated with Terreagis Rally was that they replaced Trailbreaker’s original camper shell to an open rollbar setup as well as a reinforced bumper and additional rally lights. (sorry I’m not a an off road enthusiast so I wouldn’t really know the official terms). Anyway, this post has gotten a little bit on the long side, so I’ll break it up for now and continue the rest in the next post. Stay tuned! 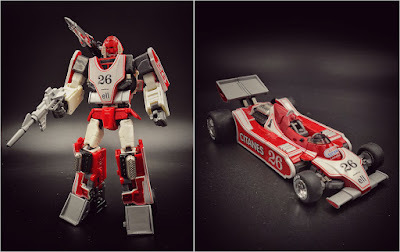 * Unfortunately the original Custom Masters by Prowl Pants no longer exists. Fortunately, Joe Toscano’s work can still be seen in his Facebook page.